In a recent Harvard Business Review article, 11 corporate CEOs shared why they champion diversity. Their themes were consistent across the board: greater diversity leads to greater diversity of thought, the attraction of top talent, and a better understanding of the customer base. In philanthropy, our customer base is usually the communities most impacted by systemic social and economic issues. When staff and trustees reflect those communities, it benefits more than the communities impacted, it benefits all of us. Programs focused on diversity, equity and inclusion expand the collective strategic thinking within an organization. Our sector is no different than the corporate sector in terms of our collective potential to become more responsive, innovative and mission-minded with staff and board members who represent diverse lived experiences and perspectives. 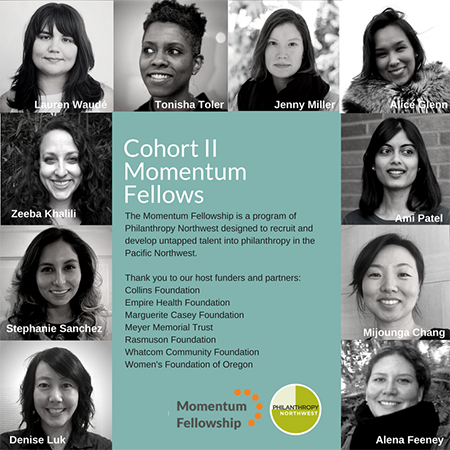 As we launch the second round of our two-year Momentum Fellowship program, it’s my honor to introduce below 10 leaders from diverse backgrounds, experiences, and communities. I hope you’ll get to meet them at #PNW17, our annual conference coming up next week, Oct. 3-5, in Vancouver, WA. Their badges will designate them as Momentum Fellows, so I strongly encourage you to approach them, say hello, engage them in their journey in philanthropy, and quiz them on what they hope to gain from their experience. These outstanding fellows represent Philanthropy Northwest’s effort to recruit and develop untapped talent, an idea that grew out of The Giving Practice’s inaugural 2015 Diversity Equity and Inclusion CEO Cohort. Since then, we have learned what it means to design and implement a pipeline program—with incredible results. Nine talented individuals rounded out the first cohort of fellows, and today, five of them are working in full-time positions in philanthropy. As we welcome our second cohort this month, we are proud to have four returning host funders, as well as three new organizations. And if there was any doubt that there is outside interest in breaking into the world of professional philanthropy, note that we had over 300 fellowship applicants. You’ll appreciate the diverse experiences as you read about each of our ten fellows. From working in aerospace and Native villages in Alaska to mentoring LGBTQ2 artists and starting radio stations, the fellows teach us what it truly means to create an environment where diverse professionals feel supported, included and set up for success. If you are interested in hosting a fellow from our third cohort in the fall of 2019, it is never too early to start planning. We encourage you to reach out to us to learn more about this exciting and important program. Alena grew up on the Big Island of Hawaii, where she learned the cultural values of living in harmony with nature and nurturing a deep sense of Aloha by sharing resources, working as a team and living life humbly with love. Alena applies these ethics in her academic and professional life by creating systems and platforms that have elevated underrepresented voices into the media. One of her proudest accomplishments was building Bellingham’s first community run radio station, KMRE 102.3 FM. Launching from a computer in a closet, three years later, it grew to include two broadcast booths, a volunteer staff of four and over 100 community members creating content for listeners. The experience led Alena to pursue a master’s degree in digital media at Washington State University, merging her passion for conservation communication with the advanced technical skills needed to build persuasive advocacy campaigns. Alena plans to continue supporting organizations that uplift humanity, protect the planet and promote equity and inclusion for all. She volunteers on the Lake Whatcom Watershed Advisory Board as well as the Cherry Point Aquatic Reserve Committee, which is overseen by Washington’s Department of Natural Resources. She looks forward to building dynamic strategies that help the community thrive at Whatcom Community Foundation. The Whatcom Community Foundation’s mission is to amplify the force of philanthropy–by connecting people, ideas and resources–so that communities flourish. Whatcom Community Foundation invests in every aspect of community: economy, housing, environment, education, health and wellness, arts and culture, food and agriculture, the nonprofit sector and neighborliness. The goal? Ensure that everyone who lives in Whatcom County thrives. An Alaskan Native (Iñupiaq Eskimo), Alice was born and raised in the northernmost city in the United States—Utqiaġvik, Alaska. When she was 10, Astronaut Harrison Schmitt visited her village to give a presentation on the geology of the moon, sparking her interest in the space program. This early passion led her to graduate with a B.S. in aerospace studies in 2014 from Embry-Riddle Aeronautical University and brought many exciting work experiences, including working on the Orion multi-purpose crew vehicle landing and recovery parachute systems. For the past year and a half, Alice has been working full-time at UMIAQ Environmental, LLC, becoming familiar with local environmental permitting procedures on the North Slope and assisting in land management permit applications, storm water pollution prevention plans and North Slope Borough permit compliance tracking. In 2016, she assisted in researching the Point Hope and Anaktuvuk Pass village comprehensive plans. She is AK-CESCL certified and recently completed an Arctic environmental sampling workshop at University of Alaska in Anchorage. She has been a contributor to the Alaska Native portal IAMIÑUPIAQ.COM. Alice plans to continue her education by entering a master’s program at Embry-Riddle Aeronautical University. She is excited to diversify her skills to benefit the 12,000 Iñupiaq Eskimo members of her Alaska Native corporation through this fellowship. A family foundation based in Anchorage Alaska, the Rasmuson Foundation’s mission is to promote a better life for Alaskans. The Foundation funds in the areas of arts and culture, health, social services, housing and promotion of philanthropy. Through its grantmaking the Foundation seeks to be a catalyst for change, helping Alaskans help themselves and embrace the diversity within the state. The foundation’s focuses its giving to organizations that demonstrate a respect for the Alaska land and its people, for sustainable economic development, and for the enhancement of the arts and social services in Alaska. Ami was born in San Jose, CA, to Gujarati Indian immigrants. The oldest of three siblings, her family eventually moved from the East Coast to California. After graduating from UCLA in 2006, Ami joined the inaugural Leadership Academy for Young People for the American Way Foundation, a program that develops progressive leaders. Working with two community-based organizations in Oakland, she learned about sharing resources and building coalitions across communities of color and organized around a statewide ballot initiative. As a longtime artist-activist, Ami returned to Los Angeles in 2009 and created her own short film through the Armed with a Camera Fellowship. She debuted a theatrical piece through East West Players’ Evoke Festival for South Asian Voices and participated in poetry workshops through Voices of Our Nations Arts Foundation. Ami then earned her master’s degreein Asian American studies, also at UCLA, focusing on the formation of Satrang, the South Asian LGBTQ group in Southern California. Ami hopes to discuss power in philanthropy and thoughtful approaches to data equity as she brings her wide range of experience to the Women’s Foundation of Oregon. Women's Foundation of Oregon's envisions a state where every woman and girl can thrive. By focusing the power of women’s collective resources, the foundation improves the lives of women and girls throughout Oregon by granting over $4 million since its inception. Denise specializes in implementing programs for nonprofits, bringing a background in social justice, law, the environment, policy and fundraising. She holds a J.D. from University of San Francisco’s School of Law and a B.A. from University of California-Berkeley. She spent nearly a decade working on national animal welfare law and supporting grassroots community advocacy in the Pacific Northwest, including stints around sustainable farming and ending abusive practices in industrial agriculture. As an environmental justice attorney, she worked directly with rural, under-resourced communities of color that are often targeted by industrial agricultural corporations when siting “factory farms.” Denise worked to protect drinking water, air, and soil quality, biodiversity and overall quality of life for such communities. Most recently, Denise worked in development for Playwrite, Inc. in Portland, empowering at-risk youth through the creative arts. At PlayWrite, she managed all fundraising activities. As a consultant, Denise has worked with Friends of Family Farmers and the Socially Responsible Agricultural Project. Denise loves exploring the world with her human and canine family but is always happy to come home to the abundant, natural beauty of the Pacific Northwest. Meyer Memorial Trust was created by the late Fred G. Meyer, founder of a chain of retail stores bearing his name throughout the Northwest. Established in 1982, Meyer has awarded roughly $700 million in grants and program-related investments to more than 3,200 organizations in Oregon and Southwest Washington. Since 2016, Meyer has focused grantmaking to dismantle barriers to equity in education, housing and the environment and to improve community conditions so that all Oregonians can reach their full potential. Jenny Miller, Inupiaq, is originally from Nome, Alaska. She brings experience in communications and grant writing in both the nonprofit and for-profit sectors, with a focus on Alaska Native organizations. Most recently, she was part of Southcentral Foundation’s public relations team, an Alaska Native-owned nonprofit health care organization. Jenny attained both a B.F.A. in photomedia and a B.A. in American Indian studies from the University of Washington. She is a Killam Fellow, Fulbright Canada alumna and studied visual arts and First Nations studies at Western University in Canada. Jenny is passionate about diversity, Indigenous leadership, initiatives that create and promote healthy and inclusive communities, LGBTQ2 equality, food sovereignty and advocacy through the arts. Her art is story driven and aims to defeat stereotypes and support inclusion. Her larger art projects have been funded by grants from National Geographic, Fulbright Canada and the Alaska Humanities Forum. Lauren was born and raised in Seattle and developed an interest in social justice during middle and high school by volunteering with the Youth Volunteer Corps, Bellevue Youth Council and Japanese American Citizens League. A family emergency during this time required financial assistance to maintain stable housing, solidifying her belief in the importance of social service programs. After graduating from the University of Washington, Lauren started working with a new immigrant and refugee minors program at a homeless youth shelter in North Seattle. It closed within one year of opening. Though it was challenging to be a part of a program collapse, Lauren found she loved working with youth and wanted a career working toward culturally-inclusive program development and nonprofit management. In 2010, she moved to Portland to pursue an M.P.A. at Portland State University. She joined Neighborhood House, where she worked for seven years, assisting with a myriad of programs including a food pantry, resource center, aging services, transportation services and housing. Today, Lauren volunteers on the Human Resources Committee for the Asian Pacific American Network of Oregon. Because of rapid gentrification in Portland, and the need for housing programs has become overwhelming. She hopes to bring the perspective of a direct service provider this fellowship. Mijounga was raised in Queens, NY and attended Mount Holyoke College. She worked at Wellspring Advisors for the past four years. As Grantmaking Support Officer in D.C. and New York, she helped manage a high volume of complex grants and improved international grantmaking processes. She also trained staff, created written and online resources and provided data reports and analysis. She served on the advisory committee to launch and advance the foundation’s racial justice initiative. Before that, Mijounga helped coordinate human rights programs at the Mertz Gilmore Foundation, working with the International Human Rights Funders Group. She has also worked and volunteered at community-based nonprofit groups advocating for racial/economic and gender justice and human rights. Mijounga’s training and background is in media, and she’s worked with organizations like Women Make Movies, Center for Asian American Media (with the annual San Francisco Asian American Film Festival) and at Independent Television Service, helping fund documentary filmmakers for public television. Mijounga was also a collective member and producer at Asia Pacific Forum, a weekly radio program on WBAI/Pacifica Radio Network that covered underrepresented Asian diasporic news and culture. Fluent in Korean and karaoke, she’s a Reiki master who dabbles in pottery and painting. Stephanie was born in Bakersfield, California to Mexican-American immigrants. She attended the University of California, Santa Barbara and was the first member of her extended family to move away to attend university. Stephanie spent a quarter in New Zealand, backpacking across the country with a small cohort studying conservation efforts. After graduating in 2015 with a B.S. in Environmental Studies, she moved to Oregon. In fall of 2016 Stephanie became a fellow through the Confluence Environmental Center AmeriCorps Fellows program. She serves Green King in Northeast Portland, building relationships with local schools and community groups and focusing on historically marginalized communities. Working alongside the Northeast Coalition of Neighborhoods, she quickly learned about the history of oppression in the region. That led her to dive into equity trainings and learning how to navigate the dominant affluent-white culture in professionalism. Armed with the historical knowledge of the neighborhood, she meaningful events to bring together new and old residents to improve public spaces in the midst of gentrification. This experience fueled her passion for collaboration as a way to strengthen communities, something she’ll continue to pursue as a Momentum Fellow. Empire Health Foundation is a private health conversion foundation formed in 2008 through the sale of Deaconess and Valley Medical, a nonprofit hospital system in Spokane. Stewarding philanthropic assets totaling approximately $80 million, the Foundation invests in ideas and organizations that that improve access, education, research and policy to result in a measurably healthier region. Tonisha moved from New York to attend Evergreen State College in 1998. She studied the systems and history of art as a social justice tool, volunteering with many organizations, developing a passion for community engagement. She has worked for the African American Museum and the Commencement Art Gallery in Tacoma; the Dulwich Picture Gallery in London; and the Museum of Man in San Diego, CA. These opportunities, combined with over 15 years working in the service industry as a barista, in-store retail clerk and server, inform her most recent work at the Regional Arts and Culture Council (RACC) in Portland. Over ten years, starting as a part-time grants assistant, she rose to support all grants administration and the organization’s Artists Professional Development workshop series and the event Art Spark. In 2011, Tonisha’s role grew to include supporting disenfranchised communities through RACC’s services. In 2013, she designed a new grant pilot program to support culturally-specific organizations. The program deepened and diversified RACC’s support of marginalized communities and built relationships that helped improve community perception of the organization. In her free time, Tonisha is a dedicated yogini and loves to converse about ‘doing the work’ of system change, and just about anything renegade! Formed in 1947 by Truman W. Collins Sr. and other members of the family of E.S. Collins, The Collins Foundation invests in Oregon’s urban and rural nonprofit organizations in order to improve quality of life and wellbeing for the people in their communities. As a funder and partner, the foundation is committed to the pursuit of equity, in resource allocation across Oregon’s diverse communities and its internal structures. Zeeba’s career has been devoted to serving youth and families across the country, focusing on underserved and marginalized individuals. Recognizing the power of philanthropists to address inequities in socioeconomic status and race, she has held positions at United Way of King County and Seattle Foundation. Zeeba also worked with several youth development organizations in Boston. As a mentor through Summer Search, she supported resilient students from low-income backgrounds as they graduated from high school, matriculated into college and became community leaders. Some of her most profound professional memories have been in attending the graduations of her mentees, as most were the first in their families to graduate high school. Zeeba holds an M.P.A. with a certificate in nonprofit management from the Evans School of Public Policy and Governance and a B.S. from Wesleyan University. After spending most of her life in the Midwest and on the East Coast, getting to know Seattle and the Pacific Northwest has been a breath of fresh air. When she’s not working, Zeeba enjoys painting, cooking Persian food and raising pink leopard Ramshorn Snails. Support and nurture strong, vibrant activism within and among families, enabling them to advocate for their own interest and improve the public and private systems that impact their lives. Examine, change and inform the advancement of social and economic policies and practices that promote the development of strong families and strong communities. Encourage the development of a coherent knowledge base for advocates, families and the organizations that serve them. Invest in system change and cross-system change in order to generate greater knowledge and provide effective working models for practice.